The major takeaways from the day. • Democrats turned the opening into a brawl, but Republicans pushed through. • Trump’s potential legal troubles were a recurring theme. 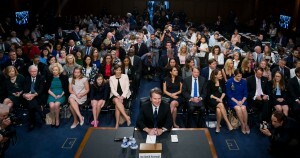 • Republicans praised Kavanaugh and expressed confidence he will be confirmed. • The hearing foreshadowed likely Democratic frustration in coming days.